" म भित्र रोनाल्डोको प्रशंसा बाहेक केहि छैनI उ संसारकै सर्वोत्कृष्ट खेलाडी हो भन्न कुनै गाह्रो छैन। विपक्षीलाई उसले गोल गर्ने त्राश अकल्पनीय हुन्छ। उसको तथ्याङ्क अविश्वसनिय छन: गोल, गोलको प्रयास, पेनाल्टी बक्समा उपस्थिति, हेडर। उ सँग सबै कौशल छन्। अति नै प्रभावशाली।"
"म रोनाल्डोको प्रशंसा गर्छु। यदि मैले एउटा फुटबल टोली बनाउनु पर्यो भने उनी मेरो रोजाईमा पर्ने पहिलो खेलाडी हुनेछन्।"
युइएफए युरोको सर्वाधिक गोलकर्ता (छनौट चरणसहित): २९ गोल, पोर्चुगलका लागि]]. ला लिगाको इतिहासमा सुरुवाती ८ खेलमा सबैभन्दा धेरै लिग गोल गर्ने खेलाडी: १५ गोल . ↑ "Cristiano Ronaldo Bio, Stats, News", ESPN FC, अन्तिम पहुँच २६ फेब्रुअरी २०१२, "Quotes: "I have nothing but praise for the boy. 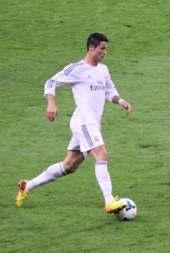 He is easily the best player in the world. 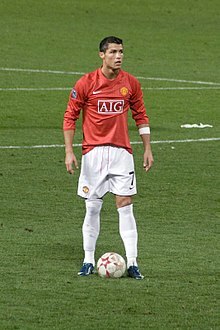 He is better than Kaka and better than Messi. He is streets ahead of them all. His contribution as a goal threat is unbelievable. His stats are incredible. Strikes at goal, attempts on goal, raids into the penalty box, headers. It is all there. Absolutely astounding." Sir Alex Ferguson, July 2009." 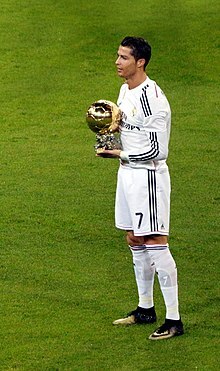 ↑ Madrid clinch Copa del Rey Sky Sports Retrieved 20 April 2011 Archived 23 April 2011 at the वेब्याक मेसिन. 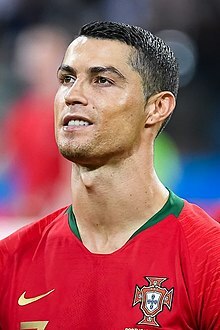 ↑ "Ronaldo named UEFA Best Player in Europe", UEFA.com, Union of European Football Associations, २८ अगस्ट २०१४, अन्तिम पहुँच २८ जुन २०१६, "After being named the winner of the UEFA Best Player in Europe Award for 2013/14 in Monaco, Cristiano Ronaldo gave his reaction to UEFA.com." 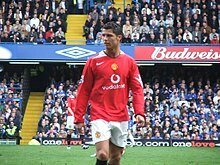 ↑ १९९.० १९९.१ "Cristiano Ronaldo, all-time top scorer in the derby against Atlético", realmadrid.com, २० नोभेम्बर २०१६, अन्तिम पहुँच २० नोभेम्बर २०१६, "Following his hat-trick at the Calderón, the Portuguese has now scored 18 goals against Atlético, surpassing Di Stéfano's record (17)." ↑ Leal, Antonio M. (२७ फेब्रुअरी २०१७), "Real Madrid have scored more than 5,900 goals in the league", RealMadrid.com, Real Madrid Club de Fútbol, अन्तिम पहुँच २८ फेब्रुअरी २०१७, "The Cristiano penalty saw the total top another hundred." 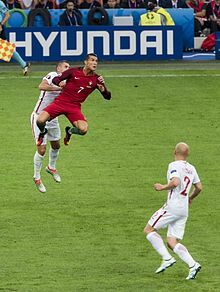 ↑ "Portugal come from behind to finish third", FIFA.com, २ जुलाई २०१७, अन्तिम पहुँच २ जुलाई २०१७, "Portugal finished their FIFA Confederations Cup Russia 2017 campaign on a high by beating Mexico 2-1 after extra time in the play-off for third place at the Spartak Stadium in Moscow in front of 42,659 fans." 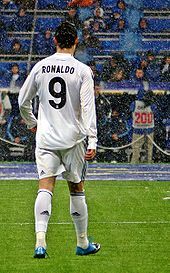 ↑ "HAT-TRICKS – CRISTIANO RONALDO – ALL-TIME REAL MADRID RECORD IN LA LIGA", RealMadrid.com, Real Madrid C.F., अन्तिम पहुँच १६ जनवरी २०१६, "CRISTIANO RONALDO'S 32 LA LIGA HAT-TRICKS"